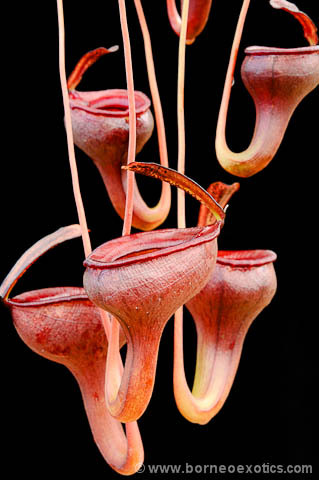 An amazing new species with fantastic traps yet it is surprisingly easy to grow. Typically, plants with traps this bizarre require absolute conditions and the patience of a saint but not N. jamban! Although it definitely prefers highland conditions, we have found it to be tolerant of a much wider range of temperatures. It is also a very quick grower, producing new traps every few weeks rather than months. This is a rare opportunity to add this plant to your collection! The plants available are small, approximately 2" across and are growing in a 2-3" deep pot. VERY LIMITED AVAILABILITY!